It’s only about 15 feet deep. It’s no Lake Michigan. But we cherish our humble urban oasis. 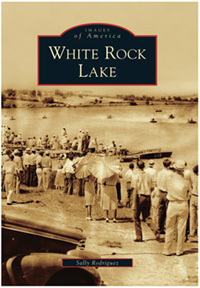 A new book celebrates 100 years of White Rock Lake. In 1909, city leaders realized they needed a water source for Dallas’ growing population. They honed in on White Rock Creek. Two years later, a little creek 10 miles east of Dallas was primped and primed and ready to become a lake. But a drought would cause a three-year gap between the completion of the dam and the filling of the lake. On April 14, 1914, White Rock Lake became official with a total of 42 inches of water over the spillway. The lake continues to be a wellspring of entertainment and an escape for Dallas residents. Images of America, White Rock Lake, by Sally Rodriguez, out this month, chronicles the creation and growth of our urban oasis. All images are reprinted with permission from the publisher. The book is available online at arcadiapublishing.com or by calling 888-313-2665. Top left: A moonlight ride among the clouds was the newest sport at White Rock Lake in July 1929. This photograph shows Henry Toncray with his seaplane on the lake. Other amphibious planes had landed at White Rock, but this was the first seaplane. 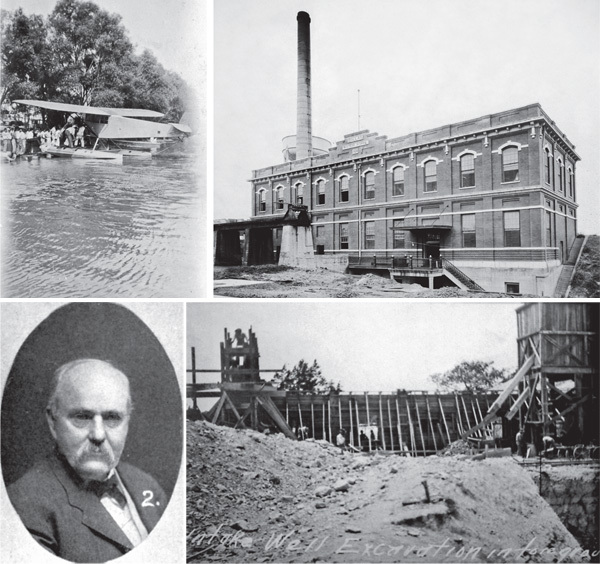 Top right: The new state-of-the-art pump station was completed in 1911. Train cars could be pushed out onto the railroad trestle to the left. Trap doors on the cars would be opened and the coal would drop to the ground directly in front of the boiler room. Staff at the pump station would then shovel the coal directly into the boiler. Bottom left: William Doran (1847-1931), city commissioner for streets and public lands, was responsible for negotiating with all the landowners to purchase the 2,292 acres that would become White Rock Lake. Doran’s Point on the north side of the lake is a tribute to him. Bottom right: Workers begin the trenching for the intake well. In the background, the walls of the dam begin to rise. Top: The 1936 Texas Centennial Exposition at Fair Park had a bank of lights behind the Hall of State that could be seen from as far away as Tyler. In this picture, the lights can be seen across White Rock Lake. Bottom left: By 1956, a drought had left slips on the east side of the lake completely dry. The concessionaires’ boats are stacked up on the shore. Bottom right: White Rock Sandwich Stand was one of several concession stands at the lake. White Rock superintendent Earl Hart (left) is pictured with one of his patrolmen. Hart was also a certified police officer, as were other members of his staff. 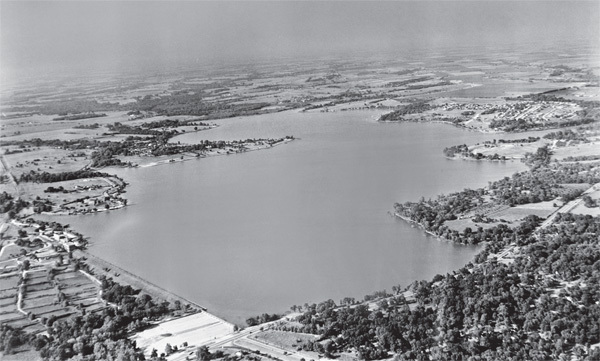 Above: Looking north from the spillway to the open fields, this 1948 aerial view shows a tranquil White Rock Lake. Behind the dam is a fish hatchery that was built in 1930. At the end of the dam is the pump house and the filter building. On the eastern shore is Winfrey Point, and behind the point is the old Civilian Conservation Corps camp. 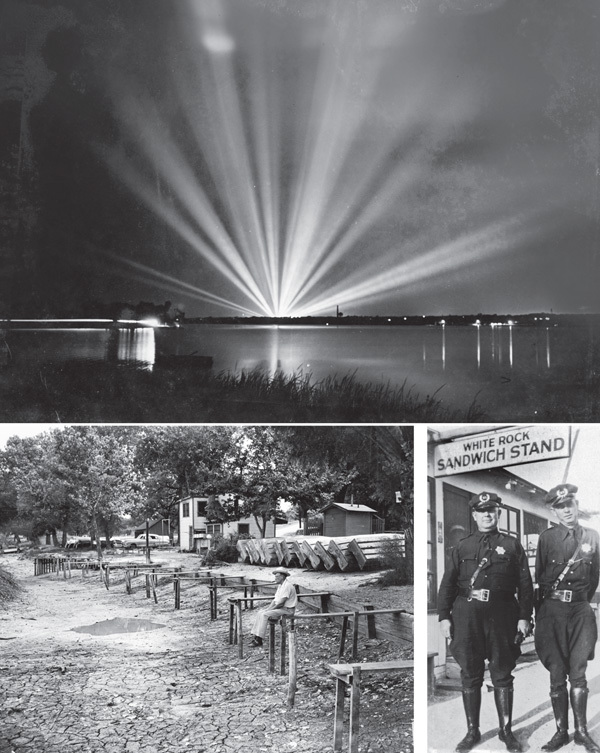 Top left: Johnny Williams brought the Bonnie Barge to White Rock Lake in 1946 and, for the next 10 years, provided afternoon and moonlight cruises. The barge held approximately 150 people and was a favorite spot to dance or find that quiet, dark corner with a sweetheart. Top right: The bathing beach at White Rock was popular for decades. In the early years, it was treated as a swimming pool, and staff would go out in a boat to chlorinate the lake. After a few years, a chlorination pipe was laid from the bathhouse to the lake. 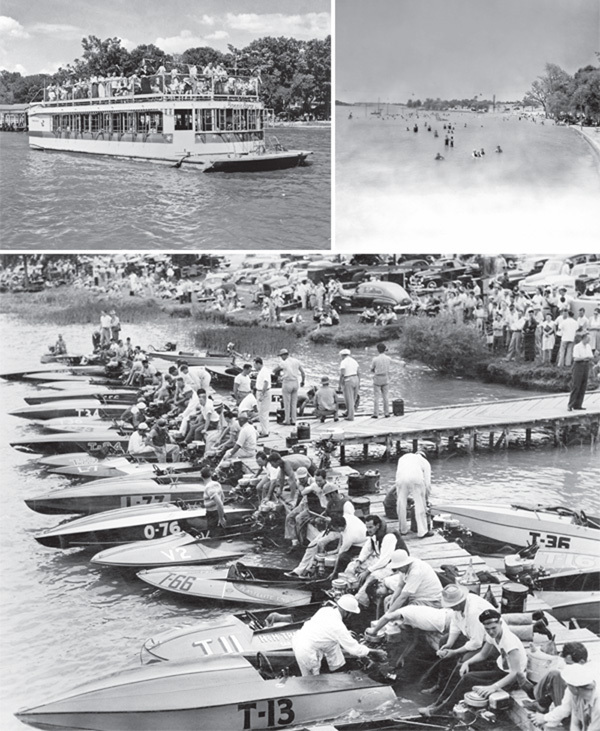 Bottom: Speedboat races were popular at White Rock Lake until the City Council passed an ordinance prohibiting boats with greater than a 10-horsepower motor. Boats are pictured lined up at the docks along the northern shore of T&P Hill in 1938.